I spent significant time this week finding quotes on the value of work for a presentation I may be giving in a few weeks. I intended to just use these quotes as interstital fillers and for a “screensaver” at the start, but I found so many that inspired me that they became a running theme throughout. Here are some of my favorites (apologies if a few of these have appeared in inspirations before). If you’re pretty happy doing what you’re doing, is it really work? I find that I can enjoy almost any task if I can slip into a focused zone while doing it. I think I enjoy the accomplishment. Good things typically don’t happen while you’re sitting around waiting for them to happen. You have to pave the way for good things, and that’s often hard work. Everything successful I’ve built in my life has involved a lot of thankless work before success ever came along. Genuine connections between people aren’t built out of texts or quick messages. If you substitute those things for real connection, you’ll find loneliness in the long run. This is really insightful and thought provoking. Try something hard rather than something easy if you want to improve. I feel this every time I work on a novel or something else that really pushes me. Few songs dig straight into my soul like this one does. Struggles and achievements go hand in hand. I’d rather be known for actually doing something than for taking credit for things I didn’t do. Eventually, the person that can actually walk the walk comes out on top of the person who can talk the talk. I’ve seen it happen over and over and over again. The tulips in front of our house are in stunning full bloom. Each day, it’s been fun watching them emerge (some at a different pace due to shade) and bloom. Even now, as they lose their bloom, they’re still beautiful. 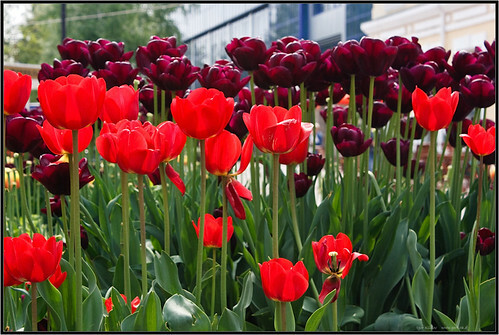 Thanks to Igor Kilsov for the image (I couldn’t get a good one of our own tulips). The only time I plan to stop being productive in my life is when I’m physically or mentally unable to produce anything. Work is too much fun. Most of the things most of us do are failures. Often, though, all we’re shown are the successes, not the hard work behind them. The clock is my single worst work interruptor. It seems like almost every time I get into a work flow, it’s interrupted by some appointment. I always do my best work when time really doesn’t matter that much.